Our Story — Primo Trailer MFG. Corp.
Coming from the trailer dealership side, my Father and I founded PRIMO in 2012. Minnesota is typically ranked number 1 or 2 in aluminum trailer sales in the nation over the past 10 years so we are a leader when it comes to understanding what customers want in an aluminum trailer. As a dealer of over 20 product lines we understood what the customer wanted. We had so many customers ask for certain things yet all of our aluminum trailer suppliers WOULD NOT deliver due to cost and insensitivity to providing what the customers were asking for! So we decided to build OUR OWN brand of aluminum trailers to meet the desires of what our customers were asking for. Hence, PRIMO Trailers was born. We have grown quickly and have recently expanded PRIMO into a separate manufacturing facility in Phoenix AZ to keep up with ongoing business demands that have consumed our business and to allow PRIMO to grow into one of the nation’s leading manufacturers of aluminum utility trailers. Our goal is to provide our customers with the best value in trailers. We feel that it is our primary job to know what products will give you the best value. That does not always mean manufacturing the cheapest trailer out on the market and selling you the cheapest trailer at a low price, although we have been told countless times that PRIMO trailers have the best prices around in comparison to other aluminum trailers! We take pride in the fact that we can produce a QUALITY aluminum trailer at an affordable price. To maintain the highest quality products at the most affordable price. To deliver the BEST VALUE possible to our customers. Steel trailers are cheaper up front but will cost more in maintenance in the long term since steel is more prone to corrosion and rust. It is possible to buy a galvanized finish on your trailer, but this doesn’t fully protect you from degradation. If you live in a snow or ocean environment, salt on the roads or from the ocean will only magnify steel’s natural rust forming tendencies. Not only does steel rust and corrode, wearing away on your investment and the integrity of your trailer, but it requires close vigilance to ensure that any minor scratches are painted before rust sets in. This goes for repairs too. If your trailer needs repairing, you’ll have to pay more for a proper finish that will ensure that rust start forming wherever the repair was made. This is especially true of joints and bolt mounts. So, even if you invest a bit more money at the beginning and buy a galvanized or protected steel coating, you’ll still have to pay more for repairs and watch your trailer’s coat closely. Conversely, aluminum trailers are more expensive up front but require less overall maintenance. The only maintenance that may need to be performed is an acid wash every few years. This quickly and easily restores the aluminum to its original luster and shine and allows for a better resale value. Additionally, manufacturers typically offer longer warranties for aluminum than steel, probably for this reason. Since many may associate aluminum with cans and other lightweight metals that are found around the house like aluminum foil, many make the assumption that aluminum is a weaker material than steel. But is this really true? Just like steel is an alloy of iron, the aluminum used in all-aluminum trailers is an alloy metal as well. (An alloy metal is comprised of a minimum of three types that lend themselves to a metal’s strength.) In the case of an all-aluminum trailer, 95% of the trailer will be composed of aluminum and the other 5% of other metals. Steel from iron alloy has a similar composition and when push comes to shove, they are both equally strong. But where aluminum and steel really differ isn’t in their “strength” per se, it’s in their flex. As an alloy, aluminum is as strong as steel but is less rigid and has more flex. This means that it will flex to a greater point and still return to its original shape before it bends permanently. Steel, on the other hand, has a lower flex point and will keep its rigidity longer than aluminum. This is often why people refer to steel as stronger but what they really mean is that it’s more rigid. This isn’t necessarily a good thing unless you will be hauling on uneven surfaces. On such surfaces the flex of aluminum could, in theory, flex to the point of breaking much earlier than steel due to its more flexible nature. But really, one could see either as an advantage unless you’ll be mostly traveling on uneven surfaces. If this is the case, then steel is for you. Aluminum trailers weigh on average 10 – 15% less than steel trailers. This means that you’ll be able to haul more with an aluminum trailer versus a steel one. (Your haul weight is your trailer weight minus your axle load bearing capacity.) Additionally, you’ll save money on gas when you happen to not be carrying a load. 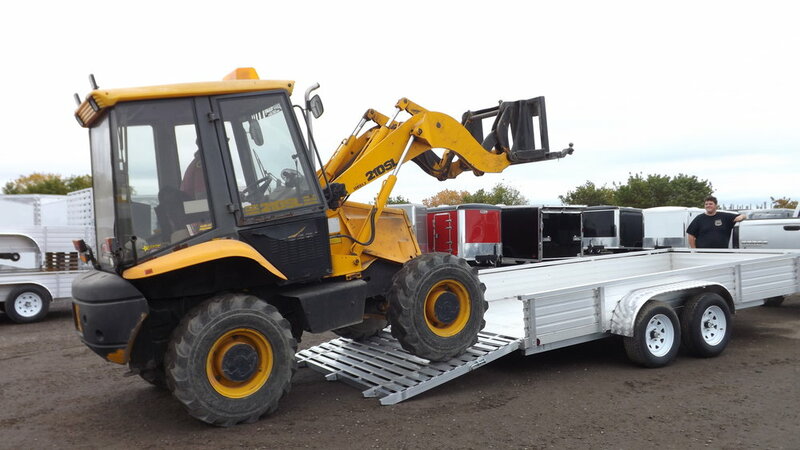 Whichever trailer material you choose, keep your usage and long-term maintenance costs in mind. You’re essentially going to pay as much for a steel trailer over the long run as you would pay for an aluminum trailer upfront. And, with the resale value of aluminum trailer’s higher, you’ll win if you ever decide to sell it.